Robert Daigle is an excellent example of what Bartlett pride is all about; determination, dedication, and commitment. Bob was a three-sport athlete during his high school days, playing football, basketball, and golf. However, he is most revered for the years following his return to Bartlett in 1979 serving as a highly influential teacher, coach, and advisor until becoming an administrator in 1990. He positively impacted over a decade of athletes and students at Bartlett High School. While serving as a coach on the staffs of Jim Healy and Hall of Fame Coach Rene Langevin, Bob's effectiveness as an offensive coordinator was exceptional, resulting in many big wins. Even more impressive though, was the special relationship he developed with many of the athletes. 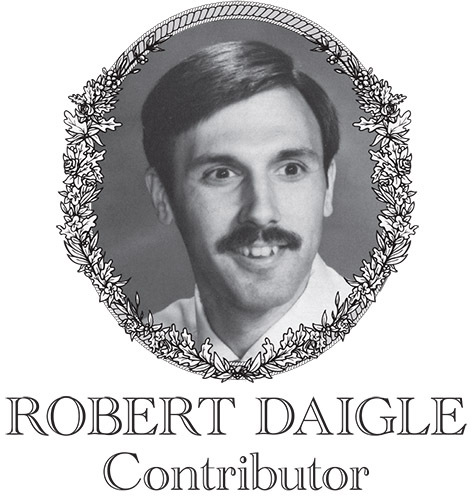 When speaking to former players from Bob's era as a coach, most will tell you that Bob Daigle is at the top of the list of coaches who made a significant difference in their lives. He was often described as an inspirational leader who knew just how to get every ounce of effort out of each of his players. Bob also promoted independent thinking and problem solving by his athletes, rather than simply having a "do as I say" mentality. He always wanted them to understand why they were doing something, rather than just doing it. To Bob, the intangible qualities were far more important than the tangibles of statistics and winning games. These influences extended beyond the field and into the school day where as a teacher and later an administrator, Bob always maintained a student-first attitude. He had an understanding of and appreciation for the uniqueness of each of his students. Bob also served as a class advisor and his commitment and genuine interest in the entire class's success was readily apparent. This allowed Bob to develop the same special relationships with all students in the school. Unfortunately, Bob's time at Bartlett was cut devastatingly short in 1991 when he suffered a heart attack at the young age of 37 while working out in the school weight room. Bob's untimely passing left a huge void in the school and community, among his athletes, students, and beyond. His legendary and iconic status among all paths that he crossed at Bartlett led to the following statement being made after his passing: "The spirit and values promoted by Bob throughout his entire life had a profound impact on many. We, your former students and players, continue to honor your example and memory." This quote speaks to the legacy that Bob Daigle left on the countless lives he touched in his time at Bartlett. Bob left behind his wife Diane and their three children Heath, Kristen, and Lauren.